Monsters exist in our world, lurking under cover of darkness, hiding their depredations behind a veil of lies. You are an ordinary person, but you have discovered the creatures that prey upon us. Now you search the city for supernatural secrets, gathering weapons, tools and lore in your own personal crusade against the unknown. 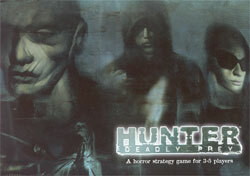 Hunter: Deadly Prey is a horror strategy game for 3-5 players. One assumes the role of the monster, protecting its unnatural existence. The rest are hunters who seek to defeat the creature. But the supernatural is not the only threat that hunters face. Their own goals clash, making them just as dangerous to each other.